The Funeral of Sean Garland at Glasnevin. 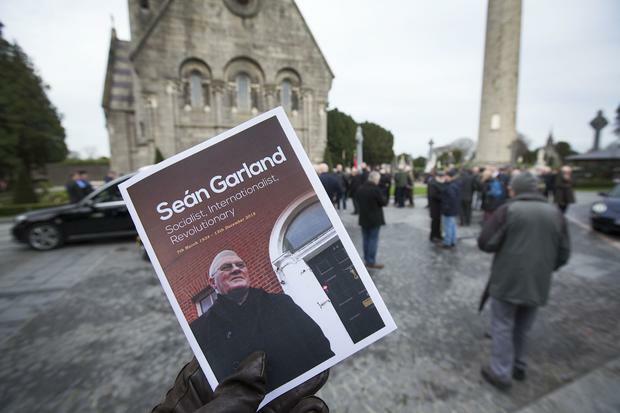 FORMER Workers’ Party President Sean Garland was not the ‘man of steel’ he was often believed to be but a ‘flesh and blood, social being’, mourners at his funeral have heard. His enemies were “bankers who brought this country into need, those at the top of the rich list and those who were ‘mean-minded enough to challenge workers’ rights in the courts,” it was claimed. A humanist ceremony was held for the former political leader at the Crematorium chapel at Glasnevin Cemetery with speakers including key members of the Workers’ Party, including former President Marian Donnelly and Chair of the Northern Committee, Gerry Grainger. The small chapel was packed to standing room, with many people travelling down from the North to attend. Unitarian clergyman and former trade unionist, Rev Chris Hudson, who played a key role in the peace process, told mourners that even last night, he had been speaking to a prominent loyalist figure who asked him to pass on his deepest sympathy to Mr Garland’s wife, Mary and their family. He also asked him to express gratitude to them on his behalf for all the work he had done for workers. “Up until recently Sean had been helping me, and advising me,” Rev Hudson revealed. Referring to Mr Garland’s role in the Official IRA ceasefire in 1972, after they split with the Belfast-led Provisionals in 1970, Rev Hudson asked: “Why is it Sean could sit in that light in 1972 when we had to wait 30 years for others to sit in that same light?”. Mr Garland’s remains were waked in West Belfast before being removed to Liberty Hall in Dublin, with a further wake before the funeral this afternoon. His wicker coffin was draped in both the tricolour and the Starry Plough. 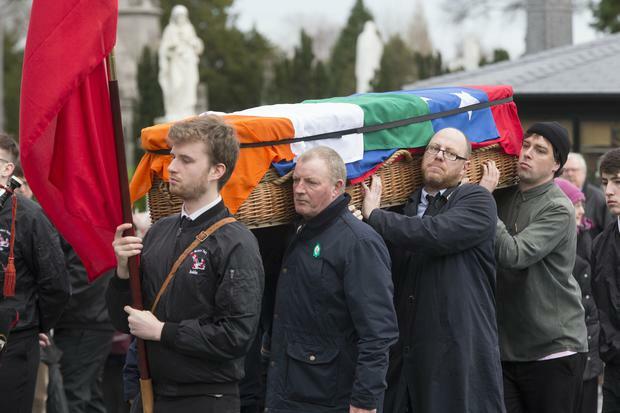 His Belfast-born widow Mary, who he met while living in Glasgow, followed close to the wicker coffin with his daughter Caoimhe, which was covered in both the Tricolour and the Starry Plough flags. A colour party comprising members of the Workers’ Party followed the hearse, carrying the same flags. A recording of Dominic Behan’s anti-sectarian song, “Our Last Hope” formed part of the ceremony, as well as the Walt Whitman poem, ‘To A Foil’d European Revolutionaire’. The trade unionist anthem Joe Hill was sung by Éilis Ryan, joined in by most of the mourners who faithfully knew the words. His tolerance for anyone who undermined the party was ‘zero’, she conceded but she said there was no doubt that he was strong and determined’, noting how he had carried to dying Sean South from the attack on the Royal Ulster Constabulary barracks in Brookborough in Co Fermanagh on January 1 1957, in an attempt to save his life. “Where did this commitment and determination come from?” she asked – before explaining that it came from his upbringing with his family in the tenements of Dublin. She said Sean had come to realise that ‘removing Britain from the Six Counties meant nothing.’ Instead, all people were ‘brothers with one hope and destiny,’ she said. “People needed freedom, not the land,” she said he had come to believe.